Summary: "Five of us had run away that fateful night just over a month before. Only three of us would be going home. And nothing, nothing would ever be the same again." Glasgow, 1965. Headstrong teenager Jack Mackay cannot allow for even the possibility of a life of predictability and routine. The seventeen-year-old has just one destination on his mind—London—and successfully convinces his four friends, and fellow bandmates, to join him in abandoning their homes to pursue a goal of musical stardom. Booking Pap Pap is finally back! He's been very busy traveling this past month and hasn't had time to write review for his daughter! (Just kidding, dad!) 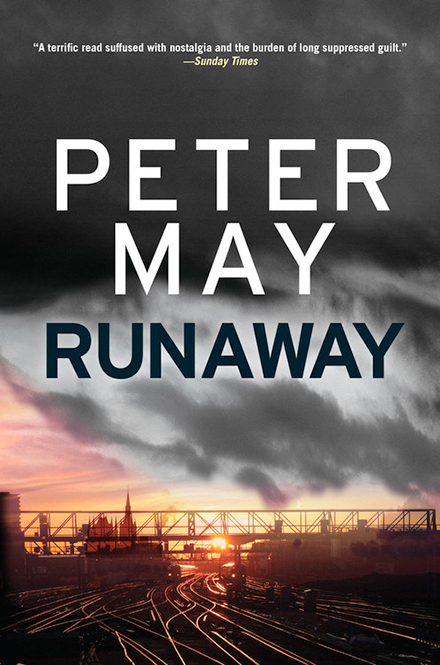 The latest book that he's read and really enjoyed is RUNAWAY by Peter May. Here are his thoughts. RUNAWAY begins in 2015 when a newspaper story of a suspicious murder in London stirs memories for terminally ill Maurie, one of the five teenage boys who ran away from Scotland to London 50 years earlier in pursuit of a music career. Maurie pleads with Jack, one of the five, to help him get back to London where he can take care of some unfinished business from 1965. So Jack and Maurie, along with David, a third member of the original group and Jack’s grandson, Ricky, head off to London to revisit the past and clear up some open issues. In 1965 when Jack, Luke, David, Maurie and Jeff ran off to London, things didn’t always go as planned. The five friends were pursued by family, stole a vehicle, were robbed, rescued Maurie’s cousin, Rachel, from a life of drugs and abuse, met several rock stars, were taken advantage of by adults, experienced a strange hippie therapy group and witnessed a murder – all in just a couple months. In 2015, the return trip also had its strange moments when they also were pursued by family members, had a car stolen, stole a car themselves and hitched a ride by faking their identity. In RUNAWAY, author Peter May moves smoothly back and forth between 1965 and 2015 to create a moving story utilizing intrigue, nostalgia, humor, sadness and determination. He also does a wonderful job of contrasting the impetuous nature of the teenager’s trip to the stoic nature of the older travelers. His description of the 1960s drug and music scenes are well done and he positioned the five teenagers perfectly in that environment. His characters are very deep and easy to visualize both as teenagers and later as elderly men. The change in Jack’s grandson, Ricky, as it relates to his perception of himself and of Jack is a meaningful side story for the reader to observe. In an interesting aside, author Peter May used his own experience as a teenager who ran away to pursue a music career in London as the basis for his novel. Although RUNAWAY is classified as a thriller, I think it is much more about relationships and success and failure. RUNAWAY is a well written story that is both entertaining and thought provoking. Welcome back Pap Pap! I have this one on my list to read. Interesting that the author drew on his own experiences. I love it when an author uses their own experiences like that. This sounds good! So happy Pap Pap is back as I always enjoy his reviews. This book looks like a real winner to me. This book has a very good storyline. Sounds exciting. This definitely sounds like a good book!